The friars (brothers) are the oldest continually-surviving branch of the Carmelite Family. The very first Carmelites were hermits living on Mount Carmel from sometime around the year 1200. When the hermits left Mount Carmel from the 1230s onwards, they settled in hermitage communities in western Europe. However, the hermits quickly realised that their way of life - depending on the land and the alms-giving of passers-by - was less sustainable than it had been in Israel-Palestine. They also perceived in the growing towns and cities of Europe a desperate spiritual and social need to be of service, particularly among the poor. Thus, in 1247 at Aylesford Priory in England, a General Chapter (meeting) of the Order was held. The brothers asked permission from the Pope to modify aspects of the 'Way of Life' document given to them by Saint Albert of Jerusalem. They adopted the three 'Evangelical Counsels' of poverty, chastity and obedience, common to religious orders. Gradually they adapted into the way of life of the mendicant (begging) orders such as the Franciscans and Dominicans. The Carmelite hermits thus became begging brothers ('friar' is derived from the Latin for brother). They ministered to the spiritual and physical needs of God's people, particularly those on the margins of Church and Society. They depended on the charitable support of the people they served. Because of their white cloaks worn over their brown habits, the Carmelite brothers became known as the Whitefriars. Although sometimes referred to as monks, the medieval Carmelites were friars. Their lifestyle was mendicant, rather than monastic. In other words, whereas monks lived in a largely enclosed monastery often in remote places, friars were more at liberty to engage with society and were usually located in towns (their communities are known as 'priories', 'friaries' or 'convents'). The notion of being 'in the midst of the people' is still very important for the friar way of life. Friars also have a distinctive model of authority and leadership. Whereas monks live under obedience to an abbot (a word which means 'father'), friars live under obedience to a prior (which means 'first', as in 'the first among equals') who is to exercise leadership in the spirit of service. The material support of friars is also different from that of monks, who historically live off their own farm produce or from renting out land, whereas friars depend on the providence of God in the form of charitable support from society. In the Middle Ages the friars became increasingly clericalised, that is, more and more brothers were ordained as priests. This happened particularly after the friars decided to develop as a 'student order', promoting higher learning amongst its ranks so as to be of greater usefulness to the Church. Today most, though not all, friars are ordained, but the identity as 'brother' remains the most fundamental aspect of a Carmelite friar's vocation, as is reflected in the official title of the Order: "The Brothers of the Blessed Virgin Mary of Mount Carmel". Carmelite friars are first and foremost brothers. As the direct descendents of the first Carmelite hermits, the friars (known as the 'first order' of Carmel because historically they developed first) have oversight of the Carmelite Family as a whole, and are responsible for its ultimate governance. The senior friar of the whole Carmelite Order is the Prior General, who lives in Rome. He is the highest authority figure within the Order, elected by a General Chapter of the friars, held every 6 years. Today there are approximately 2,000 friars of the 'Ancient Observance' of Carmelites worldwide, arranged into various provinces (regional groupings). Each Province is under the leadership of a senior brother known as the Prior Provincial. 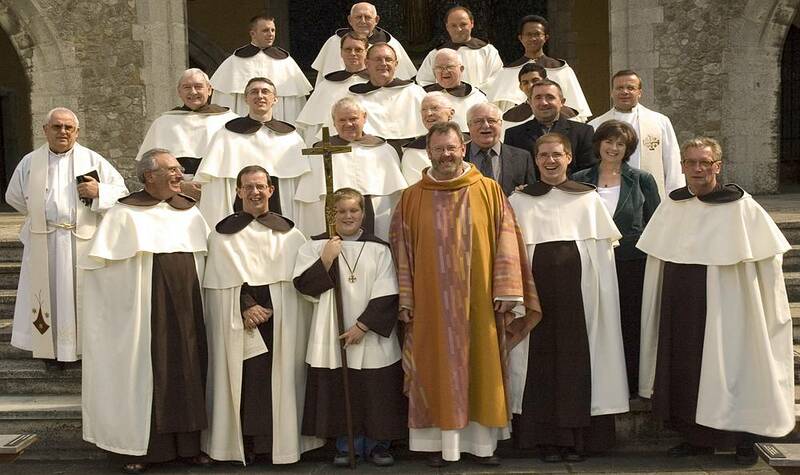 There are approximately 40 friars in the British Province of Carmelites. Most live in one of the Province's six friar communities (for details visit the Communities section of this website). Friars and friends of the British Province of Carmelites. The friars' lifestyle is inspired by the Scriptures and the Rule of Saint Albert, interpreted for today through a set of Constitutions (most recently formulated in 1995). Friars, like all Carmelites, seek to be contemplatives, that is, friends with God who are open to the will of God. Friars form praying communities at the service of all God's people. The friars are involved in a wide range of apostolates (forms of service), depending on their skills and the needs of the Church and Society. In the British Province Carmelite friars serve in parishes, in chaplaincy work (at schools, universities, prisons, hospitals and ports), in academic research and teaching, in caring for the sick and elderly, in writing and broadcasting, in administration, and of course in preaching and administering the sacraments. depicting Carmelite Friars in procession. In the Discalced Carmelite Observance there are also friars, established by St. Teresa of Jesus and St. John of the Cross initially to help in the development of the Discalced Carmelite nuns. The Discalced friars have a number of communities in England, and around the world.